The more you deny, the stronger I get. (SPOILERS) Jennifer Kent’s feature debut received a plethora of admiring notices on its release, acclaimed as a genuinely scary and seriously subtextual horror movie. The Babadook is certainly a well-made picture, and features a stunning performance from Essie Davis as a fractured parent stricken with grief and plagued by demons. But is it really all that special or different? It is virtually incumbent on horror to promise critical readings, deserved or otherwise, and this one is actually more effective before it reduces to overtly Repulsion-esque fare. Kent’s screenplay offers little in the way of narrative twists and turns so, other than the old “the monster was in her mind all along”, it doesn’t have a whole lot else in its arsenal. I wouldn’t call the last half pedestrian, but the beats are decidedly familiar. More, the fear factor of Davis’ beleaguered widow Amelia, possessed by the title character and railing against son Samuel (Noah Wiseman, plausibly eccentric and unsettling when he needs to be), takes the form of slightly clumsy broad strokes, distancing us from a far more immediate and recognisable abuse scenario. The picture’s trump card comes prior to this, setting its store by positing Samuel as the one of questionable disposition (the disruptive kid at school, consumed with dark thoughts and actions, who receives the blame even though everything he does is a consequence of his parent’s behaviour). He’s the one going on interminably about the Babadook, driving his mother and extended family to distraction. There are also the classic intimations of demon child horror movies; apparently hugging her mum inappropriately, entering her the bedroom while she is masturbating, (apparently) scratching out a photo of Amelia and her husband and (apparently) putting glass in her soup. But then the picture switches; Amelia inhales essence of Babadook and begins acting out. We realise that the (eerily over-protective) son really is defending his mother from evil. Unfortunately, the reveal is only briefly effective, as the picture veers into a welter of horror clichés of the disturbed kind. 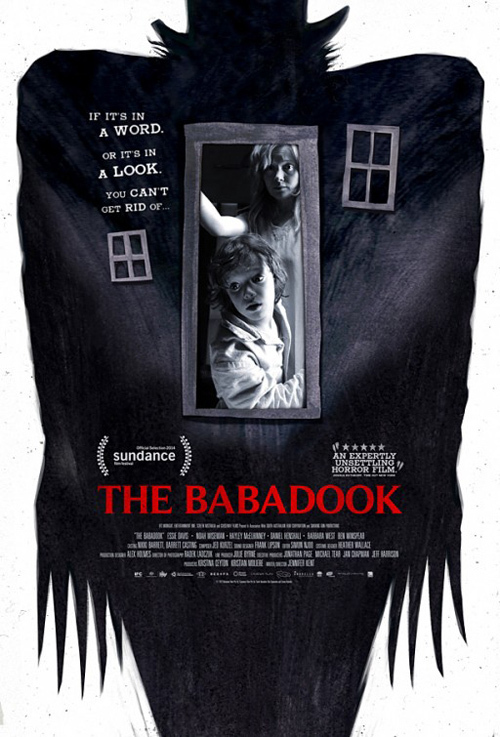 Amelie wanders about the house with a kitchen knife, sees glimpses of the Babadook everywhere (some of these are mildly effective; others, such as an attack on her car while driving, are risible), finds her kitchen infested with cockroaches (oh lord, not cockroaches!) and is plagued by a troublesome tooth she plucks out in her possessed state. Worse, Kent feels obliged to indulge the very most over-used of horror tropes, pet violence. We know that the poor pooch is getting to get it as soon as we witness a strangled hound in The Bababook book, and sure enough she breaks its neck and drops the poor pooch inert on the kitchen floor. What has been a picture lending itself to subtle shadings and interpretations suddenly finds itself with little or no restraint. 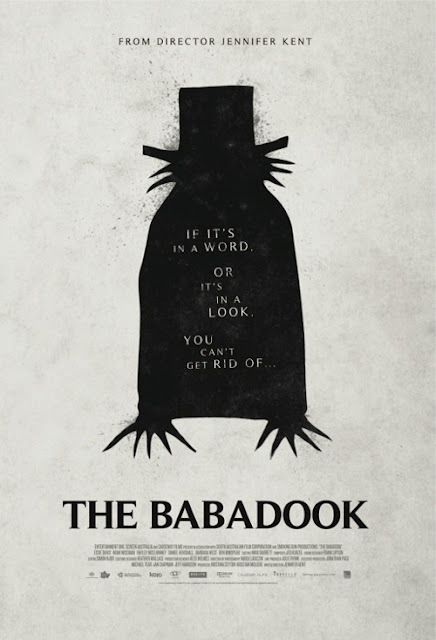 The Babadook is told from Amelia’s point of view, so the actual manner in which we come to realise her affliction as all-consuming is quite well characterised. Kent just doesn’t really know what to do when she gets there. Amelia resents Samuel, who has replaced the husband she really longs for; she refuses to celebrate her son’s birthday (the day her husband died), but it’s only when we realise the extent of her malaise that this seems wholly unreasonable. It’s the same with the access-barred basement full of his possessions. The problem is, the picture is so precise in its metaphor that Kent ends up diluting its effectiveness and resonance. The Shining plays with ambiguity of how much is in Jack’s head and how much the Overlook itself is mental, but The Babadook invites an all-encompassing reading of maternal madness. Such that Amelia taking her imprisoned grief an on-the-nose bowl of worms at the conclusion (feeding her grief just enough, keeping it in check). The monochrome decoration of the house adds to this sense of the over-stated. It could be the sort of thing you see in a Tim Burton picture; I almost expected it to splash with colour once the family was released. On the plus side, the rendering of the terror book itself is great, eerily illustrated and with the kind of deeply disturbing undertones of a Struwwelpeter (Kent has apparently indicated that Amelia is not its author, but it would makes sense for how it got into the house in the first place, and that it is unfinished). The more subtle character details are arresting, and allow for less instructive interpretation (Samuel might be labelled aspergic, and the recourse to medicate him by a frustrated parent might be regarded as a critique of the tendency to control that which is non-conforming; the Alzheimer’s neighbour is the most sympathetic character, and the one who vouches for Samuel’s ability to see things as they are – it is the suburban ne’er-do-wells like Amelia’s sister and friends who are marked out as blinkered and uncaring). And Kent has an eye for the rhythm and movement of the scene; the trip to the police station and the sight of Babadook clothing on a coat hook; the visit by child services, shadowing Amelia’s movement towards the kitchen; possessed Amelia shimmering across the floor towards her son. Kent has made a handsome picture, blessed with two strong central performances, but in the final analysis it is a little too thematically literal to fully satisfy. I've made you some gruel. No, I'm not them. And I'm not this. Cool. FaceTime without a phone. You’re standing on General Stuart. That’s terrific. Everything is terrific. This is all I ever dreamed about.